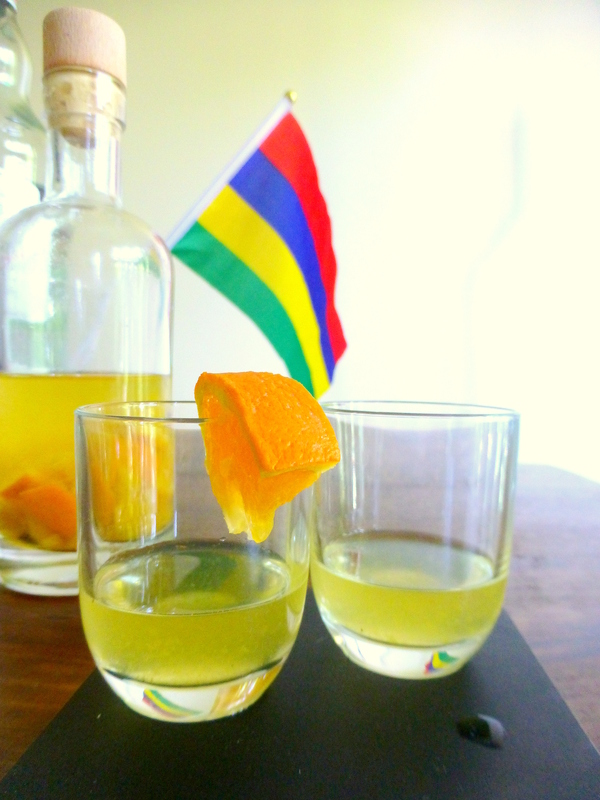 As a rum lover, an interesting thing I came across in Mauritius was ‘rhum arrangé’, rum which has been macerated with fruit, spices or a mixture of the two, along with sugar or syrup. A lot of the agricole rum in Mauritius is quite raw and can “brûle la gorge” (burn your throat) so it’s a way of making it more drinkable. It’s common is most restaurants and little bottles are readily available in supermarkets with chunks of pineapple, passion fruit, vanilla sticks and even ‘aphrodisiac’. This captured my imagination and was something else from Mauritius I was going to try at home. I like my spiced rum and have experimented before with an 8-spice mix, but rhum arrangé should be kept simple – two flavours maximum. Obviosuly, being an island in the middle of the Indian Ocean, local produce plays a big role in what’s used to flavour the rum. During my trip I tried cinnamon and vanilla, pineapple and vanilla and cinnamon and lemon. I’d bought some Mauritian vanilla from the St Aubin estate and among the cheap spices I’d brought home I had some Madagascan cinnamon. 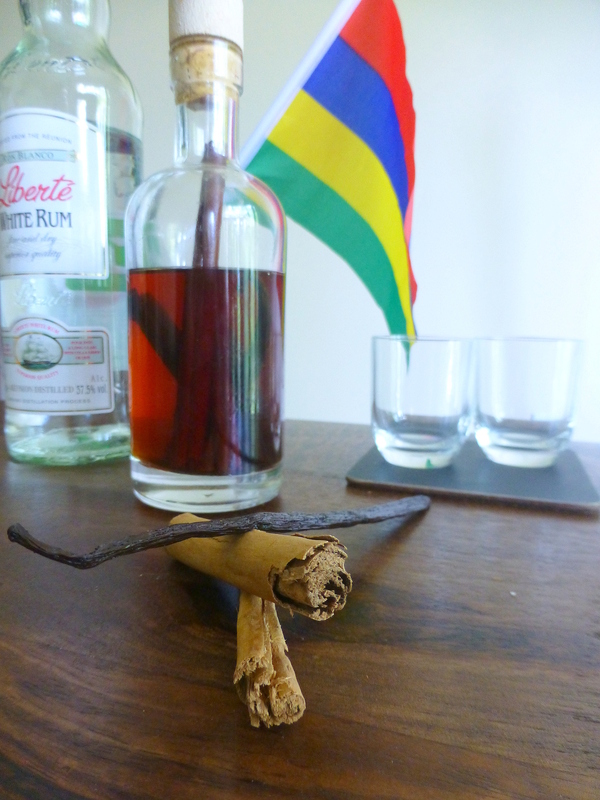 Keeping with the Mascarene theme (ok, Madagascar’s not in the Mascarenes but it’s close) I also had some Mauritian cane sugar and my trusty Reunion white rum. Quantities aren’t set, it’s just a case of leaving it to infuse for a few days and adjusting as you go. I must have added a teaspoon of sugar every day which actually helped bring through the vanilla taste too. After four teaspoons I got what I was after: a very slightly syrupy consistency and a very drinkable rum. Add the spices and two teaspoons of sugar into the bottle of rum, give it a shake and leave overnight. Add a further teaspoon of sugar and shake. Leave overnight. Taste and add another teaspoon of sugar if required. Once you’ve got the quantites as desired, the longer you leave it, the more the cinnamon and vanilla flavours will develop. Next I wanted to experiment with a fruity one. I didn’t want to try and repicate a pineapple one as Mauritian pineapples are so sweet and juicy, while the ones we get in the UK can be a bit hit or miss. For some reason I chose orange and decided to combine it with a touch of vanilla. 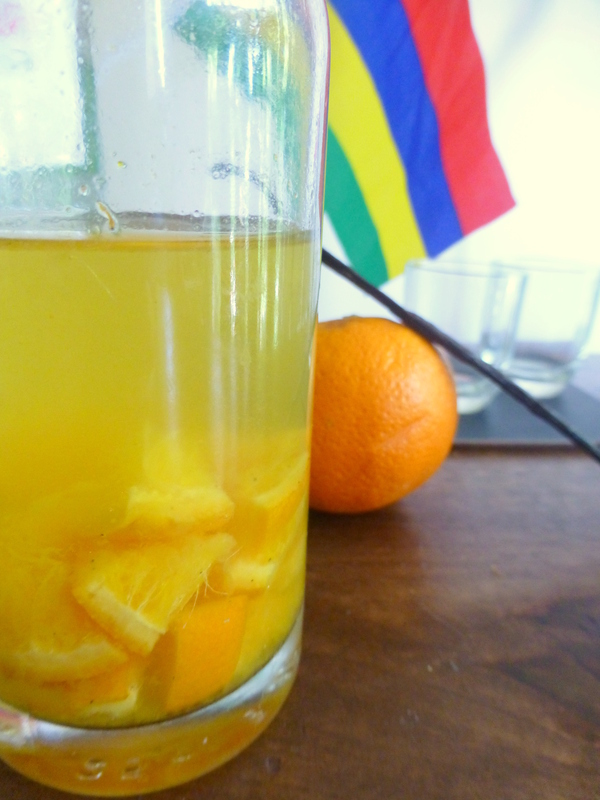 I used less sugar for this one as the juice from the orange added extra flavour and sweetness. I never saw any banana rhums arrangés in Mauritius, maybe it doesn’t work. I’ll be giving it a go soon though!